Max Factor Max Effect Fantasy Fire and Odyssey Blue Mini Nail Polishes! I was browsing in Superdrug last week and I was at the Max Factor stand when it suddenly occurred to me that I hadn't jumped on the Fantasy Fire wagon which had recently taken the beauty world by storm. So I purchased one to try out, and I also picked up the polish in Odyssey Blue too- you can never have too many nail polishes can you?! Both colours come from Max Factor's Via Tortona (Milan) nail colour collection, and they are both such stunning colours- they're glittery, bright in colour, and they're holographic too! Fantasy Fire is a purple based shade with glittery holographic shades of bronzed gold, turquoise, and blue making it an incredibly beautiful and unique shade. Whilst Odyssey Blue is a deep-blue shade that is filled with glitter! I was a little disappointed with the Fantasy Fire shade at first because it was too sheer and it looked slightly streaky, but when I lashed on 3 coats, it looked amazing! The Odyssey Blue shade didn't need as many coats to look as amazing because it's naturally pigmented in colour. I wouldn't be able to pick a favourite out of the two shades though! Max Factor Mini Nail Polishes retail at £3.99 and can be purchased at Boots and Superdrug! What are your thoughts on Max Factor's Fantasy Fire and Odyssey Mini Nail Polishes? It's easy to become disappointed by a mascara- especially if a mascara's performance rejects it's claims of what it can do. I have tried so many mascaras and the amount of times I have been disappointed by one are countless! 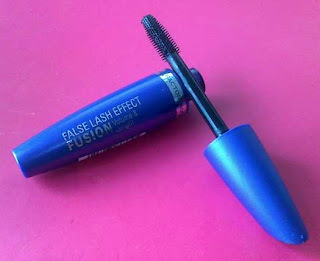 Max Factor's False Lash Effect Fusion does exactly what it says it will! The mascara claims to lengthen and volumize your lashes without the likes of clumping and smudging. I completely get put off mascaras that make your eye-lashes look clumpy after its application, so this mascara was definitely for me as the separation and definition of lashes is the number 1 thing that I look out for in a mascara! I also found this mascara easy to use on my lower lashes too; the mascara wand has lots of short bristles which helps to separate the lashes, which helps to create a wide-eyed look. I only needed one coat of this mascara and my lashes looked good to go! I love this mascara and will definitely continue to re-purchase it! However, I've heard from a few friends and bloggers that the mascara isn't as effective as it claims to be on shorter lashes. I've experienced the advantages of this mascara as I have long lashes. The mascara is priced at £11.99, which for me is a little pricey for a mascara. But it's definitely affordable when you consider that the mascara has similar (or even better) qualities to a premium beauty mascara. Have you tried Max Factor's False Lash Effect Fusion mascara? If so, what do you think of it?